theanalyticalscientist.com is also defined as “We”, “Us” and “Our” in this Privacy Notice. We are committed to protecting the privacy and security of your personal information. This privacy notice describes how we collect, use and store personal information about you during and after your business relationship with us, in accordance with the General Data Protection Regulation (GDPR). This Privacy Notice and its associated policies apply to all customers, employees and any third-party suppliers that we use during the course of our business. We are a “data controller”, registration number ZA005023. This means that We are responsible for deciding how We hold and use personal information about you. We are required under the data protection legislation to notify of the information contained in this Privacy Notice. It is important that you read this notice together with any other privacy notice that We may provide on specific occasions when We are collecting or processing personal information about you, so that you are fully aware of how and why we are using your personal information. We strive to provide a safe, secure user experience. This Privacy Notice sets forth the online data collection and usage policies and practices that apply to Our Websites (hereinafter referred to as the “the Websites”). Your personal data will be stored and processed in whole or in part in the European Union. If you access the Websites outside the European Union, you will be asked for your consent before you are able to have full access to the Websites. This is to ensure that you fully understand the risks associated with data transfers outside the EU and also what We do to ensure the safety and integrity of your data. This is covered below in the Data Transfer section of this Privacy Notice. The Websites contain links to other websites over which we have no control. We are not responsible for the privacy policies or practices of other websites to which you choose to link from the Websites. When you visit the Websites, there are two types of information you might provide to us: personal information you knowingly choose to disclose and website use information collected by us as you interact with our website (see below). We also gather or may gather certain information about your use of our site, such as what areas you visit and what services you access. Moreover, there is information about your computer hardware and software that we collect or may collect. This information can include, without limitation, your IP address, browser type, domain names, access times, your name and email address which has been collected via social media (Twitter, LinkedIn and Facebook) and referring website addresses. Please remember that if you post any of your personal information in public and/or Social Network areas of the Websites, such as in online forums or chat rooms, such information may be displayed to other users of these services and may be collected and used by others over whom we have no control. We are not responsible for the use made by third parties of information you post or otherwise make available in public areas of the Websites. We retain indefinitely all the information we gather about you in an effort to make your repeat use of our websites more efficient, practical, and relevant. In accordance with our data retention policy, a copy of which is available upon request. We may also use the information we gather to inform you of other similar products or services available from the Websites including application notes, product profiles, webinars, events and new content or to contact you to ask for your opinion of current products and services (“Related Marketing Information”. For such Related Marketing Information legitimate interest will be the legal basis for Texere [and the Texere Group of companies] to process your personal data to enable Us to send you the Related Marketing Information. The legitimate interest in such circumstances is that Texere [and the companies in the Texere Group] wishes to make a business communication to our customers and account holders about similar products or services which are available to you on the above listed Websites and which, based on our existing relationship with you. If you do not wish to receive this Related marketing Information please confirm your wish to Opt Out by either unsubscribing following the instructions at the bottom of the marketing emails or by contacting us directly as per the Opt In and Opt Out Choices section below. We may use your contact information in order to send you email, postal mail or telephone regarding updates to the Websites, such as, newsletters, new opportunities, and additional listings which may be of interest to you. We may also use it to send you information about third-party products and services that match your interests and preferences. The nature and frequency of these messages will vary depending upon the information we have about you. In addition, at the time of registration for certain services, you have the option to elect to receive additional communications, information, newsletters, and promotions relating to topics that may be of special interest to you. Application Notes/Product Profiles/Partner Channels offer manufacturers the opportunity to describe the performance and capabilities of a product or technique in a specific application. Application Notes/Product Profiles/Partner Channels are considered as advertising material. We transfer the personal information we collect about you to the following country outside the EU (North America) in order to perform our contract with you. There is an adequacy decision by the European Commission in respect of that country. This means that the country to which we transfer your data are deemed to provide an adequate level of protection for your personal information. However, to ensure that your personal information does receive an adequate level of protection we are putting in place the following appropriate measure to ensure that your personal information is treated by those third parties in a way that is consistent with and which respects the EU and UK laws on data protection: EU Model Clauses Agreement. If you require further information about this protective measure, it is available on request. The registration forms and other sections of the Websites where we collect your information provide you with relevant opt-in and opt-out choices regarding promotional activity and other communications with you. You can also update your preferences at any time via your account which you can access via theanalyticalscientist.com. You can manage your preferences or unsubscribe at any time by logging in to your account on our website or emailing us at info@theanalyticalscientist.com or contacting us by post at The Analytical Scientist, Booths Park 1, Chelford Road, Knutsford, Cheshire, WA16 8GS, UK. Account holders may opt in for third-party informational emails or opt out of all email communication, with the exception of messages relating to your account. 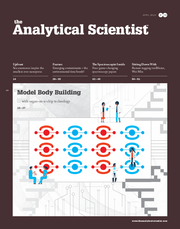 The Analytical Scientist is a controlled circulation magazine available free to selected individuals at the publisher's discretion. We have, or may have, an area where you can submit feedback. Any feedback you submit in this area becomes our property, and we may contact you for further information unless you tick the Opt-Out box in the page provided. We do not disclose to third parties your personal information, combined personal and demographic information, or information about your use of the Websites (such as the areas you visit or the services you access), except as set forth in the following four subparagraphs. We require third parties to respect the security of your data and to treat it in accordance with the law and we will have a contract in place with each of these third parties to ensure the protection of your personal information. 1. We may disclose such information to third parties if you have provided your consent to such disclosure. For example, we may use data we have about you (such as the interests and preferences you have expressed) to determine whether you might be interested in the products or services of a particular third party. 2. We may disclose such information to companies and individuals we employ to perform functions on our behalf. Examples may include hosting our web servers, analysing data, providing marketing assistance, and providing customer service. These companies and individuals will have access to your personal information as necessary to perform their functions, but they may not share that information with any other third party. 3. We may disclose such information if legally required to do so, if requested to do so by a governmental entity, a regulator or if we believe in good faith that such action is necessary to: (a) conform to legal requirements or comply with legal process; (b) protect the rights or property of Texere Publishing Limited, Texere Limited, Texere Publishing Inc, Texere Quartz Events Ltd, The Analytical Scientist/The Medicine Maker/The Ophthalmologist/The Pathologist/The Translational Scientist/Humanity in Science Award/The Cannabis Scientist/The Spectroscopist (c) prevent a crime or protect national security; or (d) protect the personal safety of users or the public. 4. We may disclose and transfer such information to a third party who acquires all or a substantial portion of Texere Publishing Limited, Texere Limited, Texere Publishing Inc, Texere Quartz Events Ltd, The Analytical Scientist/The Medicine Maker/The Ophthalmologist/The Pathologist/The Translational Scientist/Humanity in Science Award/The Cannabis Scientist/The Spectroscopist, whether such acquisition is by way of merger, consolidation, or purchase of all or a substantial portion of our assets. In addition, in the event that Texere Publishing Limited, Texere Limited, Texere Publishing Inc, Texere Quartz Events Ltd, The Analytical Scientist/The Medicine Maker/The Ophthalmologist/The Pathologist/The Translational Scientist/Humanity in Science Award/The Cannabis Scientist/The Spectroscopist Websites becomes the subject of insolvency proceedings, whether voluntary or involuntary, Texere Publishing Limited, Texere Limited, Texere Publishing Inc, Texere Quartz Events Ltd, The Analytical Scientist/The Medicine Maker/The Ophthalmologist/The Pathologist/The Translational Scientist/Humanity in Science Award/The Cannabis Scientist/The Spectroscopist or its liquidator may sell, license, or otherwise dispose of such information. Texere Publishing Limited, Texere Limited, Texere Publishing Inc, Texere Quartz Events Ltd, The Analytical Scientist/The Medicine Maker/The Ophthalmologist/The Pathologist/The Translational Scientist/Humanity in Science Award/The Cannabis Scientist/The Spectroscopist may also share aggregated anonymous information about visitors to the Website with its clients, partners, and other third parties so that they may understand the kinds of visitors to the Website and how those visitors use the site. All our third-parties who have access to your personal data are required to take appropriate security measures to protect your personal information in line with our policies and this is supported by a contractual agreement with clear obligations on the third parties. We do not allow our third-parties to use your personal data for their own purposes. We only permit them to process your personal data for specified purposes and in accordance with our written instructions. Social networking services provided on the Websites may have additional terms of conduct, privacy policies, and privacy settings that you will be required to agree to and set when you register for such services. You have the ability to accept or decline all cookies. Most web browsers automatically accept cookies, but you can usually modify your browser setting to decline all cookies if you prefer. Alternatively, you may be able to modify your browser setting to notify you each time a cookie is tendered and permit you to accept or decline cookies on an individual basis. It is not possible to sign in to the Websites without accepting cookies. If you choose to decline cookies, however, you may not be able to use the full functionality of the Websites. Our web pages may contain electronic images known as web beacons (sometimes called single-pixel GIFs) that allow us to count users who have visited those pages and to deliver co-branded services. Web beacons are not used to access your personally identifiable information on the Websites; they are a technique we use to compile aggregated statistics about our Websites usage. Web beacons collect only a limited set of information including a cookie number, time and date of a page view, and a description of the page on which the web beacon resides. The Websites use Google Analytics, a web analytics service provided by Google, Inc. (“Google”). Google Analytics uses “cookies”, which are text files placed on your computer, to help the Websites analyze how users use the site. The information generated by the cookie about your use of the Websites will be transmitted to and stored by Google on servers in the United States. In case that IP-anonymisation is activated on the Websites, your IP address will be truncated within the area of Member States of the European Union or other parties to the Agreement on the European Economic Area. Only in exceptional cases the whole IP address will be first transferred to a Google server in the USA and truncated there. IP-anonymisation is active on the Website. Google will use this information on behalf of the operator of the Websites for the purpose of evaluating your use of the Websites, compiling reports on Websites activity for the Websites operators and providing them other services relating to Websites activity and internet usage. You can also opt out of being tracked by Google Analytics in the future by downloading and installing Google Analytics Opt out Browser Addon for your current web browser: tools.google.com/dlpage/gaoptout. We have implemented appropriate technical and organizational measures designed to secure your personal information from accidental loss and from unauthorized access, use, alteration, or disclosure. However, we cannot guarantee that unauthorized third parties will never be able to defeat those measures or use your personal information for improper purposes. Details of these appropriate technical and organisational measures are available upon request. Third parties will only process your personal information on our written instructions and where they have agreed to treat the information confidentially and to keep it secure as part of their contractual arrangement with us. The Websites are not intended for children under 13 years of age. We do not knowingly collect personal information from children under 13. We will securely store and retain your personal data in accordance with our data retention policy which is available upon request. We ensure that we only hold the personal data for the purpose for which it was originally collected and for as long as is necessary in order to fulfil that purpose. Once the purpose has been met and, in accordance with our data retention policy, we will securely delete your personal data. If you want to review, verify, correct or request erasure of your personal information, object to the processing of your personal data, or request that we transfer a copy of your personal information to another party, please contact Our [data protection manager], Tracey Nicholls, in writing at Texere Publishing Ltd Booths Park 1, Chelford Rd, Knutsford, Cheshire, WA16 8GS, UK. Your use of the Websites shall indicate your understanding and acceptance of the terms of this Privacy Statement. If you do not agree with all of the terms herein, you should not use The Websites or services. If we decide to change our Privacy Statement for the Websites, we will post those changes here so that you will always know what information we gather, how we might use that information, and to whom we will disclose it. If at any time, you have questions or concerns about this Privacy Statement, please feel free to e-mail us info@texerepublishing.com or Call us at +44 (0) 1565 745 200 and speak to one of our representatives. We welcome your comments concerning this Privacy Statement. If you believe that we have not adhered to this statement, please contact us by e-mailing us at info@texerepublishing.com We will use commercially reasonable efforts to promptly determine and remedy the problem. Thank you for using The Analytical Scientist Websites. You have the right to make a complaint at any time to the Information Commissioner's Office (ICO), the UK supervisory authority for any data protection issues.